It’s lonely out in gold-land without Indians doing their traditional holiday buying. What’s the deal? Why are they staying on the sidelines? There are a number of reasons. Most of them have been touched on before, but the main reason is that urban Indians have recently emerged from the dark ages of superstitious adherence to rigid traditional values – and stepped right into the utter blackness wherein the modern banking caste thrives. Bank-issued credit has helped India transform itself from a country without a middle class beset by city slums, poverty, cholera and famines into a modern-day miracle that in no way falls short of the Chinese miracle. Naturally, that is something to be proud of, and Indians rightfully are - so, just as naturally, they tend to go along with their newfound appreciation for western financial wizardry. Unsurprisingly, they have promptly expressed that appreciation by sinking a good part of wealth into it. There is one more reason that has not been discussed much, but it is a direct corollary from the last sentence above. The Indian middle class that has squandered away its former gold wealth for an ephemeral illusion of even vaster future riches has gambled away its last undergarment and is now in no position to buy anywhere near the traditional amount of gold anymore. In good old western tradition, they lost their britches in the stock market. Now, they are reduced to bargain-hunters as they are only willing to re-enter the gold market at prices substantially below $800 per ounce. India’s BSE (Bombay Stock Exchange) has lost more than 50% of its December 2007 peak value. Gold (even its comedians exchange paper-contract variety) has only lost 20% in the same period. Now, all those illusory riches are gone, however, and the adverse wealth effect of standing naked in the cold winds of a global stock market rout is forcing Indians to conserve their resources, so they’re just not buying much gold.. The question to answer is – how well are they conserving resources by staying in cash or money market funds, or whatever? How much better could they do by returning to the safety of gold? After all, gold is the only financial asset that is maximally insulated from the foibles of uninformed and corrupt policy makers. India's inflation slowed more than economists expected to a four-month low, giving the central bank room to keep injecting cash into the financial system without fanning prices. Mind you, that the ‘four-month low’ reported in the first article came in at 11.44 percent. That’s not that far of a cry from the expected 11.86 percent. Mind you, also, that a 0.42% difference can easily be finagled in order to give the central bank the ‘reason’ it needs for dropping its interest rate. Once you’re talking about price-inflation in the double-digits, half of a single-point drop isn’t exactly overwhelming – or even mildly encouraging. With the economy of India’s major trading partner, the US, about to be completely undermined and swallowed up by government largesse, and with the Europeans also not doing all that well on that front, who will farm out their personal services to (no longer all that low-priced) Indian virtual assistants? One thing is certain: The latest drop of the derivative price-illusion we call ‘Comex-gold’ into the sub-$800 region has proven that gold at or near $700 is viewed as a tremendous bargain, especially in India. This, combined with the stock-rout induced reluctance to buy at prices above $850 may well keep Comex gold in that tight range between these numbers for the near future. However, when viewed in comparison with the fifty-plus percent losses of other asset classes, gold – even its third-cousin derivative variety traded on the New York Commodities Exchange – is proving, once again, that it is indeed the most reliable and therefore superior wealth storage facility man has ever known. In times like these, who could ask for more? Major stock markets worldwide have already tumbled over the fifty percent ledge and are about to resume their free fall. Many others will follow. I don’t know about you, but the chance of buying into an asset that has already suffered most of its potential decline (Friday’s Comex close for derivative gold came in at $782.90 for the 24hr contract) sound pretty good to me. That is especially true at a time when the world is holding its breath to await the Lehman implosion’s second-round effects on the credit default-swaps market, when protection-sellers are forced to fork it over, this coming Tuesday. Push the rewind button on this phenomenon a few more times while worldwide stock markets keep on tumbling and long-term interest rates keep heading the other way, and you can see why more and more people will come to the realization that, indeed, there is safety in ‘them thar hills’ where gold can be found. All the while, credit markets are responding only in the most underwhelming fashion to hyper-billion dollar government bailouts.You know very well what happens when the credit doesn’t flow in a credit-fueled global economy. It’s the same thing that happens when gasoline doesn’t flow through the carburetors of your car’s engine: nothing. That spreading perception of where true financial safety can be found will trickle down even into the nether reaches of the Valley of Comex where the derivatives-river of paper-gold flows like a non-potable, poisonous version of milk and honey. It has long been known that paper factories are some of the worst polluters of our waterways. It’s the same with the Comex’ manufactured stream of paper contracts. Soon enough, even fund managers will have to return to the valley to drink their fill of the poisonous mixture. What else can they load up on to reduce damage to their portfolios? Their funds’ digestive tracts are not set up for physical intake. Meanwhile, physical gold owners (there are still many Indians among them) will safely look on from the hillsides as the polluted river below turns into a raging torrent. Now, back to the Indians’ erstwhile darling, the bombing-stock exchange. Where is the BSE’s Price-Floor? 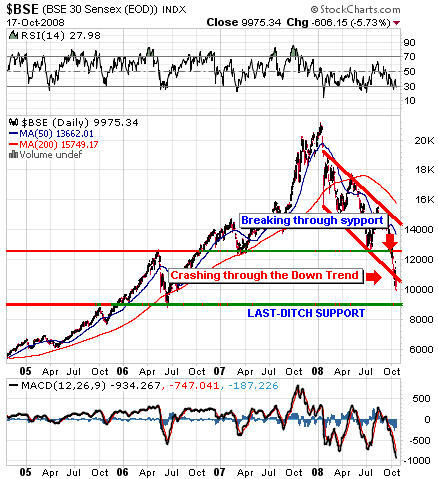 There is no technical support worth talking about below the 9000 point mark – all the way back to 6000 which, if reached, would set the BSE back to where it was at the end of 2005 – five years ago! What’s worse, the fact that the index currently stands at less than 10,000 means it has already breached the 50 percent retracement level from its blow-off peak at 21,000. There truly isn’t much support below. Indian price-inflation, meanwhile, gives the purchasing power of Indian-held cash an eleven percent haircut every year as we have seen above. Combine that little tidbit with the Royal Bank of India’s plans to inject billions of new cash into the economy, and you know that inflation numbers won’t get much better anytime soon. On that front, many Indians are mistakenly drawing comfort he fact that the economy is slowing and inflation is therefore perceived as less of a problem by policy makers but, unfortunately, that is little more than a ruse. Contrary to the media-honed popular view, slowing economic activity, by itself, does not make general price-inflation go away. It makes it worse. In short, slowing or even negative growth won’t cure inflation because the ‘demand-model’ for explaining the phenomenon we call inflation is fundamentally flawed. It intentionally confuses cause and effect so that people would not catch on to the bankers’ game of bait and switch. Keynesian economic theory holds that price inflation is demand-driven. As people demand more stuff, it becomes more and more scarce, so prices rise. That’s all good and well, but it completely ignores what the actual cause for the rising demand is. 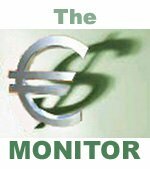 Austrian economists, on the other hand, have properly diagnosed the disease when they posited that the increased demand is the precise result of an increased supply of credit-money. In other words, all the economic ‘growth’ Keynesians like to brag about is nothing other than classic mal-investment. It’s fake – and it eventually collapses in on itself, just like any other good Ponzi scheme. Current world market conditions are a living testimony to this simple fact of life. Excessive monetary inflation is the more price-inflationary the slower the underlying economy grows. Put another way, growth of monetary aggregates that is roughly in sync with economic growth (whether mal-investment or not) doesn’t produce much price-inflation, at least for the time being. It is when monetary inflation far exceeds the rate of economic growth that prices start to climb more rapidly. Now, picture a situation with strong monetary growth that occurs during a time when GDP actually declines – and you have a perfect recipe for hyperinflation. Right now, we have a situation of massive global monetary or credit-inflation combined with a mounting global recession. Under normal circumstances, this additional credit translates into economic growth/mal-investment. Unfortunately, this time around in the West, banks aren’t lending much, at all. They are hoarding cash to cover expected future writedowns and to keep themselves from falling into insolvency. As a result, all of that newly injected (central-bank-borrowed) cash just sits there, decorating the banks’ balance sheets. That may make them look pretty for the holiday season, but it won’t make shoppers go to the stores and it won’t be used by consumers and companies to pay bills – and that means it won’t even reach the general economy. What’s worse, the banks aren’t even lending this cash to each other because they all know that it has to be paid back to the Fed whence it was borrowed. That means they all know it is a ruse because they themselves have taken advantage of the same cosmetic treatment, and they know it isn’t even skin-deep. It’s only lipstick on the proverbial pig. That means the governments will have to pony up even more money to guarantee deposits of more failing banks..
That means they will have to borrow more money from their domestic public and from abroad. For that to work, either their own citizens or foreigners will have to have extra money lying around that they can afford to loan out to a spendthrift outfit like the US and other western governments. And, since that extra money is becoming increasingly scarce as this process unwinds, the lending stream of money will dry up. That, finally, will force these governments to borrow more money from their central banks and that is the same as monetising the debt, which is purely inflationary. It will also drive down government debt prices, boosting longer term interest rates in the process, which further depresses the housing market and makes rescheduling ARM loans gone-bad just a tad more difficult. In order to prevent further loan defaults at home and abroad, the governments will then have to step in again and guarantee new loans at below market rates – which will only serve to further compound an already bad problem. So - What About India? Indian banks are getting tighter with issuing credit to their public as well, but Indian inter-bank lending hasn’t suffered anywhere near to the same degree as in the West, simply because Indian banks aren’t quite as exposed to defaulting US mortgages as the West is. It’s the same with the Indian commercial paper market. It has suffered because the downturn in stocks caused the big funds to liquidate their positions in order to meet their own liquidity requirements (when their investors sell their shares, they want whatever is left of their money back), but the cause of that is not western-style mortgage defaults.. So, after all is said and done, without steady US and European demand for Indian services, Indian stock markets will have a very tough time climbing back to anywhere near the BSE’s recent peak at 21,000. That’s a deliberate understatement. Accordingly, money flows back into these markets will be severely limited. The incentive to get back into still falling stocks just isn’t that great. Gold, on the other hand, being no man’s liability and not dependent on anyone else’s performance, will very likely regain its traditional attractiveness to Indian investors. At the very least, Indian frugality and value judgments likely keep a floor under the Comex-price of gold at or very near current world prices – something that cannot exactly be said about any other asset type. And that, in the end, is probably the best reason why gold as an investment asset will remain attractive to investors, even western-style fund managers, for many years to come. 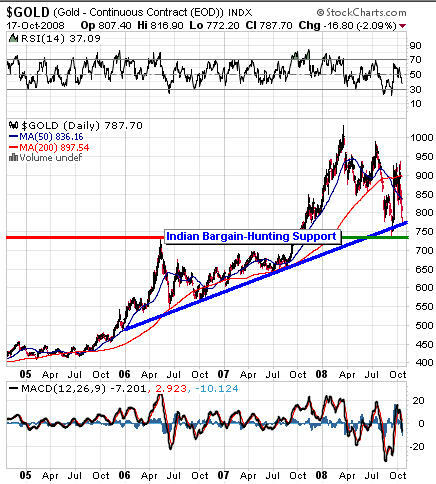 In the end, it cannot be said that India has really become ‘anti-gold’. It is just in the process of re-evaluating its traditional relationship to the metal. The most probable outcome of that evaluation period is that Indian investors will stick with what has served them so well in the past and what we now know would have served them far better than stocks did - had they stuck with it.